Pre-order your CFSWP WOD tracking book now for $20.00. We are taking orders from now until June 12th. We will not be getting many extras, so if you want or need one then we suggest you order one asap. 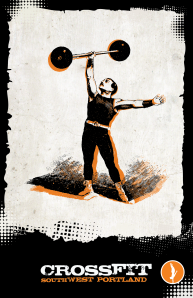 Wod tracking book includes daily wod entries, tracking of benchmark wods, weightlifting, goals and movement standards. Also includes nutrition guideline and tips. Highly recommended to help track you keep track of your overall performance and fitness goals.